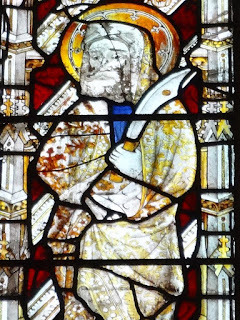 At Sandwich in Kent there is a small chapel dedicated to St Bartholomew, and they keep their patronal feast-day by giving out much safer things than knives: buns and biscuits. The tradition is that after a service in the chapel in honour of Bartholomew, children run around the church (one lap) and are given a currant bun for their efforts, while the adults are given a biscuit stamped with the seal of the hospital. They call this the Bartlemas 'bun run', and it takes place on St Bartholomew's Day unless that day falls on a weekend - as this year - in which case it takes place on Monday or Friday. I went on Friday, and it was a delightful occasion. As the chances of most of my readers ever being in Sandwich on Bartlemas Day seem remote, I thought I'd share some photographs of the event with you. I've lived near Sandwich all my life and only learned about this yearly custom on the day before it took place, but having learned of it, I couldn't resist the idea of going. I was hoping for something rather like one of Oxford's Ascension Day traditions (of throwing pennies to schoolchildren from a tower), and was not disappointed. I conclude that all over the country there are unsung people engaging in quaint traditions like this; the monks of Crowland would undoubtedly approve. 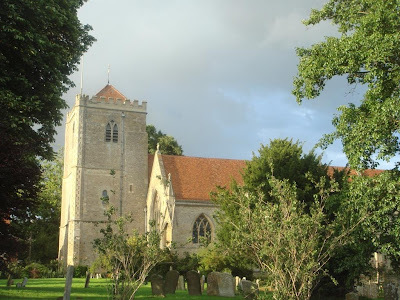 St Bartholomew's in Sandwich is in fact the chapel of an ancient hospital, probably founded in the thirteenth century for the care of travellers and pilgrims on their way to and from Canterbury. In the days when Sandwich was an important port, it must have been a busy place. From its early days it also provided accommodation for elderly residents of the town, and it is this tradition which survives to the present; it's now a complex of almshouses, with sixteen homes clustered around the central chapel. Residents must have lived in Sandwich for more than twenty years and be over the age of 50, and according to the rules of the hospital they must regularly attend services in the chapel. Just in case you think you've accidentally slipped through a time warp into Trollope's Barchester. In the knowledge of his Lord. "Greater things thou yet shall see"? The third verse references a story in John's Gospel (1:43-51) about the first meeting between Christ and Nathanael (believed to be another name for Bartholomew). I'm fond of this vivid little story, with its memorable bits of dialogue: "Can any good come out of Nazareth? "; "an Israelite in whom is no guile"; "You will see greater things than these". Ellerton's hymn makes elegant use of this story and of Nathanael's extraordinary question, "How do you know me? ", which, as the hymn freely admits, is made all the more striking by the fact that we know so little of this apostle; 'his saintly life is hidden / In the knowledge of his Lord'. The story of Christ and Nathanael is concerned with both knowledge and acknowledgement, as Nathanael, seeking to test for himself the truth of Philip's statement that they have found the Messiah, finds himself known and knowing in the same moment of recognition. It seems appropriate, then, that the hymn encourages us to think about knowledge and memory, the partial and imperfect state of what we know and the 'earth-born mists' which cloud our memory and record. The cynical reader (I'm sure you're out there!) might think this is nothing more than a rather mendacious way of dealing with the problem of celebrating a saint about whom we know little; but it seemed particularly appropriate in this patronal service, for it's not only the saint but the founders and benefactors and past members of the hospital whose deeds have been nearly forgotten by history. I couldn't even find a date for Henry de Sandwich's death, and the date of foundation stamped on the biscuits - 1190 - doesn't fit with the date of 1217 given elsewhere. All historians are familiar with such absences and inconsistencies; there are so many things about the past we will simply never know. But it doesn't always matter. 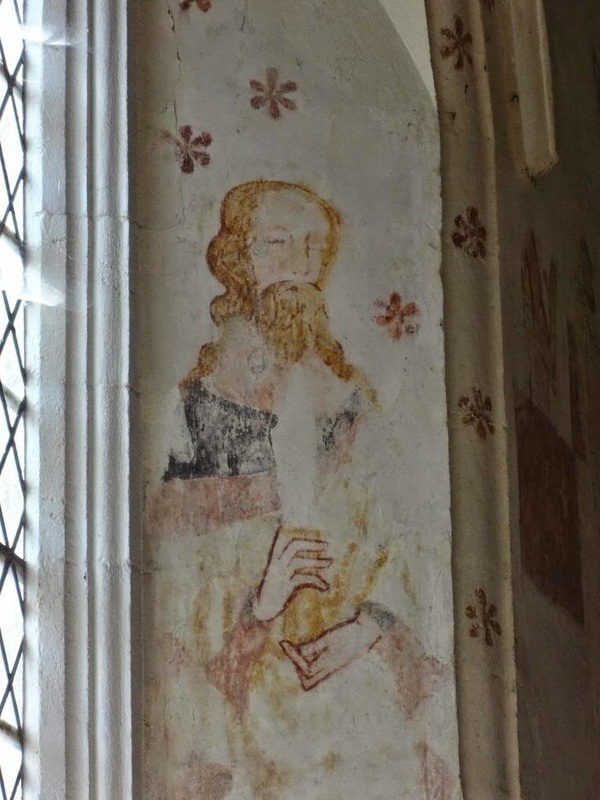 Along with John's story about Nathanael, the other reading in the service was the passage from Ecclesiasticus: 'Let us now praise famous men, and our fathers which begat us'. And this, like the hymn with its Wordsworthian "nameless, unremembered" saints, reminds us of the value of even hidden acts: 'And some there be, which have no memorial; who are perished, as though they had never been; and are become as though they had never been born; and their children after them. But these were merciful men, whose righteousness hath not been forgotten.' Many unremembered acts of charity have gone towards the support of places like St Bartholomew's, over the 800 years of its history, and we can acknowledge them, although we do not know them. In the Middle Ages Canterbury possessed the arm of St Bartholomew (as well as the port of Sandwich). It had been purchased for the cathedral priory by Queen Emma, wife of Cnut, in the 1020s or 1030s. 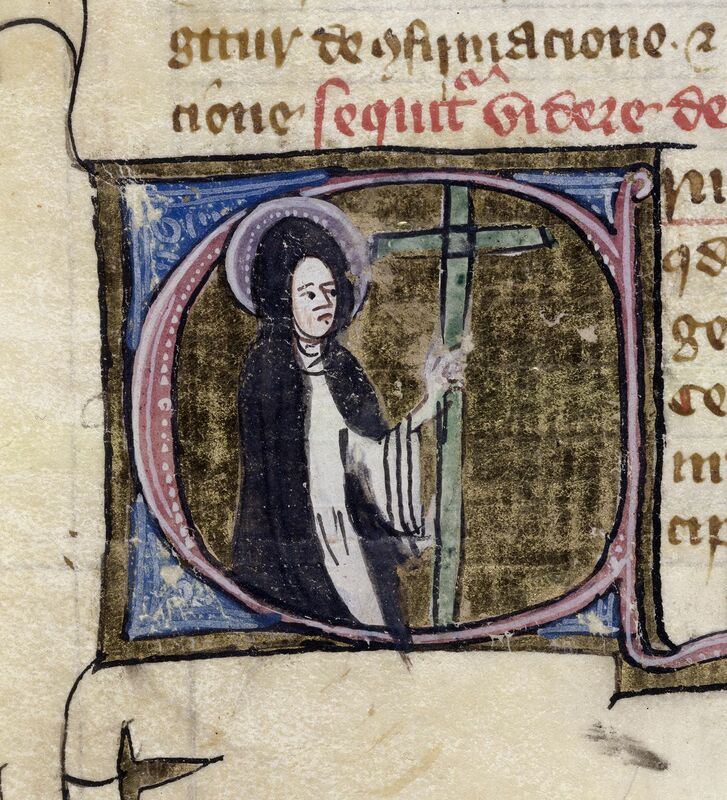 She bought it from the Bishop of Benevento, who was then in England raising funds by the sale of relics, and in return for the arm the monks of Canterbury gave the bishop a fine cope as a gift. 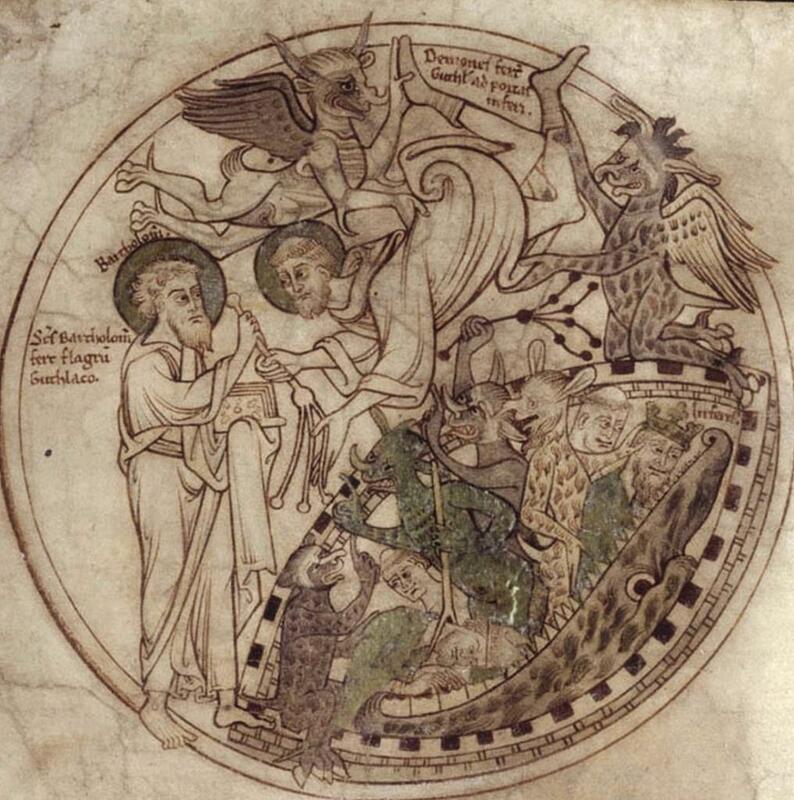 We know about this because of an endearing story told by the historian Eadmer, who was brought up from childhood in the monastery at Canterbury, and in the decades after the Norman Conquest did more than anyone to ensure that Canterbury's Anglo-Saxon past was not lost to the 'earth-born mists' of history. When Eadmer was travelling with St Anselm in Italy in 1098, he spotted the very same cope which the Canterbury monks had exchanged for Bartholomew's arm being worn at the Council of Bari. Far from home, Eadmer was thrilled to see this little piece of England. Recording the incident in his Historia Novorum, he explains to us that he recognised the cope from the stories of senior Canterbury monks: he recalls that when he was a boy being educated in the cathedral school, three older monks - he gives us their names, Edwin, Blacman and Farman - "used to recount consistently and in sequence" all the details of Queen Emma's transaction, and the ceremony of the exchange of relic and cope, which they had witnessed. "In those days people in England considered the relics of saints more valuable than anything else in the world", he adds, perhaps a little wistfully, as he tells this story about story-telling, remembering the old monks' memories. When he recognised the cope in Italy, excitable Eadmer went to tell the bishop who was wearing it of his discovery (I like to imagine Anselm tolerantly smiling all the while at Eadmer's characteristically parochial enthusiasm), and the bishop graciously confirmed the truth of Canterbury's tradition. This story suggests all kinds of interesting things about memory and oral transmission in eleventh-century England, and the way traditions were perpetuated within communities; it's unusual to have such specific details of the means by which knowledge was transmitted from one generation to another. Young Eadmer, listening to Edwin and the others tell their story, was not very different from the children at St Bartholomew's who ran the other day to receive their currant buns, watched over by their elders; one purpose of such ceremonies is to imprint their memory on the younger generation, specifically in this case the principle of St Bartholomew's ancient tradition of charity. The elders were once children themselves, and one day the running children may be the watching hospitallians in their wheelchairs. With stories, current buns and biscuits, we ensure that our children know about the past so that one day they will remember and acknowledge it as we do. Eadmer's story about Bartholomew's arm, like the tale of Nathanael under the fig-tree, encourages us to ask ourselves questions about knowledge: what do we know and how do we know it? 'How do you know me?' is the apostle's question; 'Hwanon cuðest ðu me? ', as the Old English translation puts it. 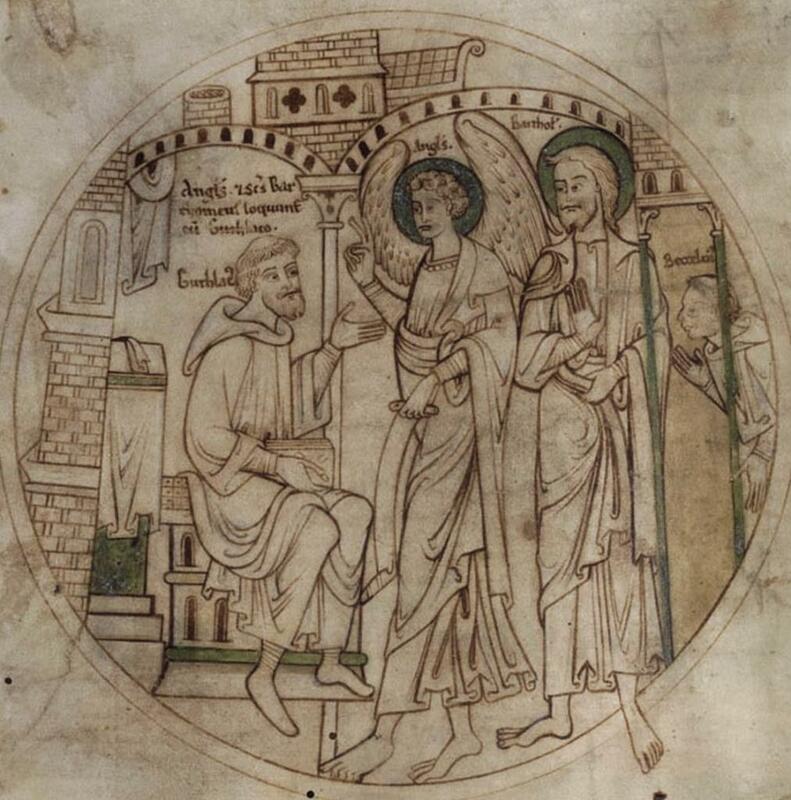 Eadmer, a historian to his finger-tips, is constantly alert to these questions in his work, and his explanation of how he knows the story of Bartholomew's arm is as characteristic as his excitement in seeing a memento of Canterbury in far-off Italy. I almost wonder if Eadmer's recognition of the cope is actually meant to recall the story of Nathanael/Bartholomew's recognition, given that it's almost the only thing anyone knows about the saint in question. In his eagerness to prove that something good can come out of Nazareth (or rather, pre-Conquest England) Eadmer has preserved the record of an event which would otherwise be completely lost; and without his story those three monks, Edwin, Blacman, and Farman, would have joined the countless numbers whose names and lives history has not preserved. It's no bad thing to be forced to confront the limits of our knowledge, and to have cause to acknowledge and commemorate those whose names we don't know, or those who are, like those three otherwise unrecorded monks, only names to us. 'To know' and 'to acknowledge, recognise' both come ultimately from the Old English verb cnawan, which covers the sense of both words. When we remember the nameless people of the past, we acknowledge and confess our inheritance from them - and perhaps in that sense we do know them, even if we don't know their names. Following on from a post back in June, here are two more prayers from the collection of the Chester nun, Margery Byrkenhed. In the manuscript each one has the heading 'a good prayer' - perhaps an aide memoire, or a recommendation to future readers like you and me. As before, the text can be found here. 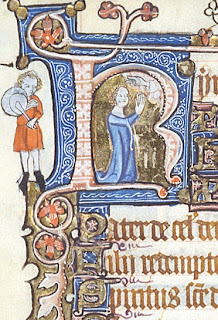 O the moste swetest spouse of my sowle criste Jhu desyryng heretely euer more for to be with the in mynde and wyll, and to lett noo erthly thyng be soo nygh myn hertt as the criste Jhu. And that I dreede nott for to dye for to goo to the criste Jhu. And that I may euer more say to the wt a gladd cheere, my Lord my godd my souereigne Sauyoure crist Jhu. I beseche ye hertely take me Synnar vnto thy greate mercy and grace. For I loue the with all myn hertt wt all my mynde and wh all my myght, and nothyng so myche in erthe nor aboue the erthe as I doo the my swete Lord crist Jhu. And for yt I haue nott loued the, nor worshipped the aboue all thyngs as my lord my god and my Sauyoure criste Jhu I beseche the with mekenes and hert contrite of mercy and of forgevenes of my greate vnkyndenes for the great loue that thowe shewdest for me and all mankynd what tyme thow offredest thy glorious body god and man vnto the crosse ther to be crucified ande wounded, and vnto thy glorious hertt a sharp spere, there rennyng oute plentuously blode and water for the redempcion and saluacion of me and all mankynde. And thus hauyng remembraunce stedfastly in my hert of the my sauyour cryste Jhu I dowtt not but thow wylt be full nyghe me and comfort me both bodely and gostely wt thy glorious presens. And at the last, bryng me vnto thyn euerlastyng blysse the whiche shall neuer haue ende. Amen. O most sweetest spouse of my soul, Christ Jesu, desiring heartily ever more to be with thee in mind and will, and to let no earthly thing be so nigh to my heart as thee, Christ Jesu, that I may not dread to die for to go to thee, Christ Jesu, and that I may ever more say to thee with a glad spirit, my Lord, my God, my sovereign Saviour Christ Jesu, I beseech thee heartily, take me, a sinner, unto thy great mercy and grace. For I love thee with all my heart, with all my mind and with all my might, and love nothing so much in earth nor above the earth as I do thee, my sweet Lord Christ Jesu. And for the times when I have not loved thee nor worshipped thee above all things as my Lord, my God and my Saviour Christ Jesu, I beseech thee with meekness and a contrite heart for mercy and forgiveness of my great ingratitude for the great love that thou showdest for me and all mankind when thou offeredest thy glorious body, God and Man, unto the cross, there to be crucified and wounded, and unto thy glorious heart a sharp spear, there running out plenteously blood and water for the redemption and salvation of me and all mankind. And thus having remembrance steadfastly in my heart of thee, my Saviour Christ Jesu, I doubt not but that thou wilt be full nigh me and comfort me both bodily and spiritually with thy glorious presence. And at the last, bring me unto thine everlasting bliss which shall never have an end. Amen. That thou suffred for my transgression. That must teche me wt the worlde to be called a ffole. Yt the wysdom of the worlde be cleene fro me A goo. In whome is all my comford my ioy and my solace. Amen – Jhesus – Maria – Johannes. That thou suffered for my transgression. That must teach me by the world to be called a fool. That the wisdom of the world may clean from me go. In whom is all my comfort, my joy and my solace. Amen – Jesus – Maria – John. It's not great poetry, nor is the other great prose; but there's a kind of yearning in these prayers which makes them moving for me - a depth of feeling which finds ordinary language inadequate, and spills beyond the bounds of such things as grammar and logical syntax. For those of us who strive to produce 'good' writing, there's always a danger of choosing a neat phrase over one which is messy or clumsily expressed, yet more accurate; I like to imagine that the person who wrote the first prayer chose, in the service of humility, 'by the world to be called a fool' (or a bad writer) rather than turn an elegant phrase with less feeling in it. It's worth noting that the uses of the name 'Jesu' are quite typical of prayers of this period - in the first the phrase 'Christ Jesu' serves as a kind of punctuation, like a breath between petitions, and in the second the repetition of the name evokes a fervour of desire and devotion. 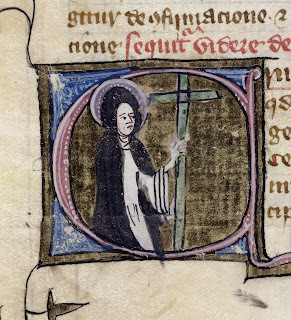 The end of the fifteenth century saw the institution of the Feast of the Holy Name, so Margery Byrkenhed was a woman of her time. Beneath its clover and its barley-sheaves. The little grassy valley that you see. While yet the thought of glorious Summer lives. Of those who once their yearning hearts have blessed? Have we been happy on our day of rest? Perchance its ending would not seem so vain. This is a poem William Morris wrote in August 1867, while on holiday near Day's Lock, on the Thames in Oxfordshire. 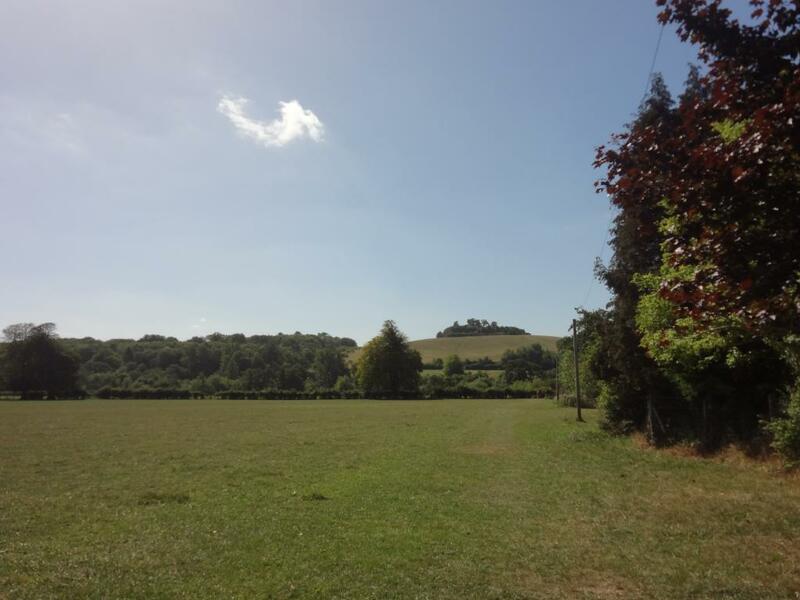 'The trenched hill of Sinodun' is better known (to me, anyway) by the more homely name of Wittenham Clumps, two distinctive hills which overlook the river and the nearby village of Dorchester-on-Thames, whose 'long-roofed church' is mentioned in the poem. Sinodun was the Celtic name for this group of hills, which over the centuries have been ploughed from one ridge into two little knobs (hence 'the gap made by our English hinds'). But it was a hillfort long before that, in the Iron Age, and even the name 'Sinodun' means 'Old Fort' (or so I'm informed), so it was already old two thousand years ago. The Romans encamped here too, and so the Saxons, when they came, called it 'Dorchester'; then they built a church which became a cathedral, and then an abbey. To the wanderer over the Downs, the two hillocks may be landmark and companion for many solitary hours of wayfaring across the wide sweeps that fade from gold to distant blue. In a first stanza, which was struck out, the place lives again to anyone who knows it well... Thus have I seen it, the corn-land mellow under the burning August sun, on cross-country travelling from London to our Kelmscott home. 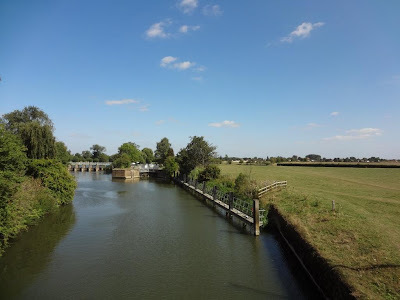 But the first time we youngsters saw Sinodun Hill was on a delightful river-journey we made from the house in Hammersmith up the Thames to Kelmscott. 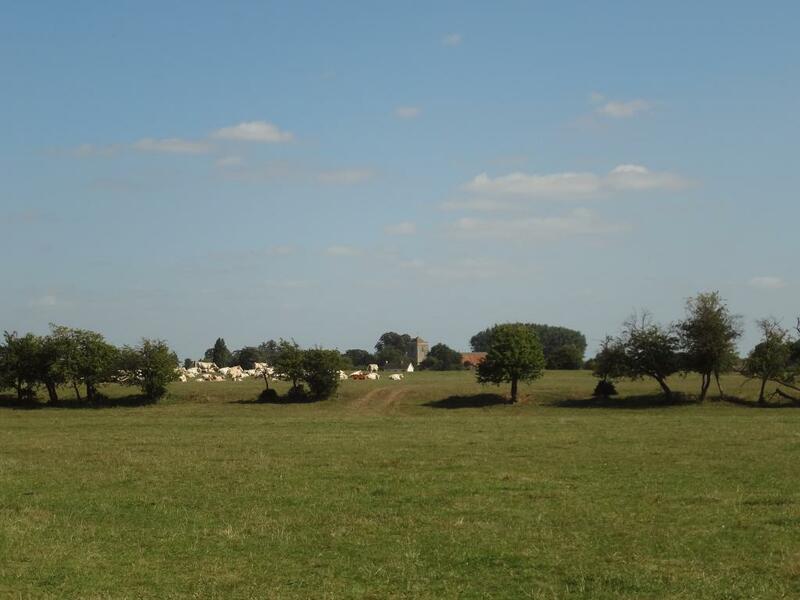 For some reason, we had not much time at Dorchester, but I remember that my father insisted on us children going up to see the entrenchments - and eager enough were we to fill in the long and happy days with any new delight. The passionate interest he took in these things impressed itself on us, and the strangeness of that first sight of the ancient earthworks, linked with the simple explanation given us of what they meant, will always hang about the picture my mind retains of them. It was already twilight as we clambered over the rough grass, and back to the river and our company: the colour had gone out of the world, and as I look back trying to live again the impressions of the evening, something of the ancient people seems to have lingered in the hushed uncertain evening time, and the momentary oppression and melancholy of it come over me once more as I write. I was at Day's Lock two weeks ago and it looked exactly like the scene Morris describes - including the 'moveless wave' of the unharvested golden meadow. As we sat by the river we could hear across the fields the bells of Dorchester Abbey, ringing a special peal to celebrate the birth of the new baby prince. 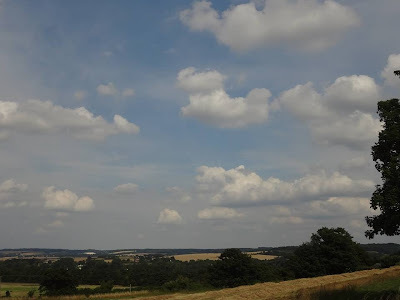 It was a vivid reminder of the here and now, but in the 'long lapse of time' these hills have seen, the century and a half which separates my visit and Morris' seems like very little space. The names and the landscape itself tell a much longer story. I find that phrase 'disembodied names' a curious one - all names are disembodied, in so far as they are only words. Are they disembodied because the people who gave them to the landscape have disappeared? Or because the landscape has changed while the names have not? But if the name adheres to the landscape, and holds with it the memory of the people who gave it - just as the landscape shows their traces and trenches - the relationship between them is a more intimate one, entwined so closely as to be almost inseparable. The hills body forth the names. What's more, this specific landscape itself is particularly like a body, as some of the less respectable nicknames for Wittenham Clumps make clear. Or maybe I only thought of this because I've been working a lot lately on Norse mythology, and in the Norse creation myth the earth was created from the body of the slain giant Ymir: the hills are made of his bones, the sky of his skull. I wonder what the people who camped at Dorchester in the Iron Age thought the hill was made of. 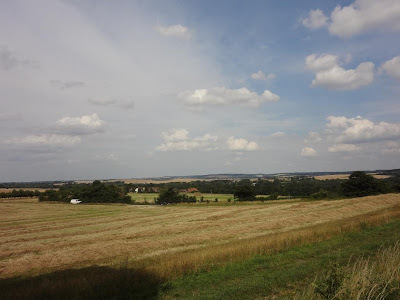 A few days ago I was in another part of the Thames valley, a little way to the south of Dorchester, where the river meets the Ridgeway and the Icknield Way. 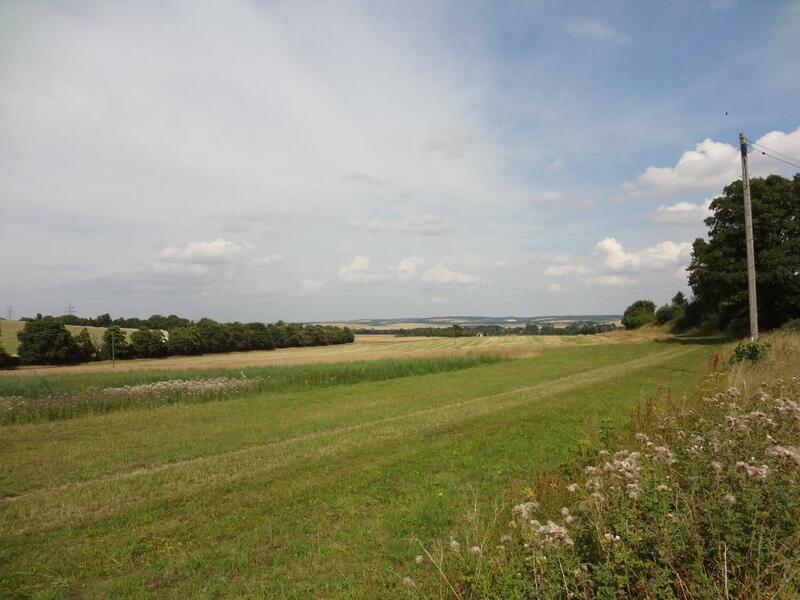 These too are part of the area's pre-Roman, even pre-Celtic history, trackways really almost literally as old as the hills, which run cross-country from Dorset to East Anglia (for details, see the Ridgeway and the Icknield Way). This picture and the two at the top were taken from the Ridgeway, looking north towards Dorchester. It's an ordinary-looking road; if I were an archaeologist I might be able to tell there was something ancient about it, but otherwise all it has to distinguish it is the name - and such names! The roads cross the river at a gap in the hills - a natural one, this time - which is logically-yet-poetically called the Goring Gap. 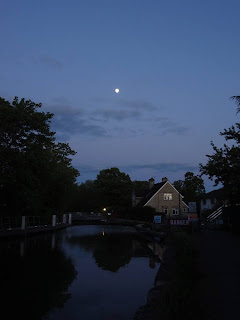 Goring is the village on the Oxfordshire side of the river at this crossing-place; on the other side, in Berkshire, is Streatley, which got its name from those very 'streets'. To the Anglo-Saxons, who did not build paved roads, the relics of paved Roman trackways which crossed Britain were foreign enough to need a foreign name - stræt, from Latin strata. Like William Morris, the Saxons were conscious of the presence of previous builders in the landscapes they inhabited, but where he and we can muse on Celts and Romans and settlers and shepherds, the Saxons who gave names to most of these places could only look back at an impenetrable mist of history. They called Roman ruins like the streets of Streatley eald enta geweorc, 'the ancient work of giants' (or ents, if you prefer), not I think because they necessarily believed that only giants could make such things, but because living amid the relics of a civilisation visibly great and powerful, yet irredeemably past and gone, makes one feel like a child scrambling up into a king's high seat - small, and insignificant. Perhaps this was what the Norse poets meant when they wrote about the earth being made from the body of Ymir. Their giants could make even the gods look small, and since the world, backwards through time and onwards through space, is so much greater than the little part of it that we can see, it can only be the work of giants. First of all, welcome to the readers who came to my previous post on the Danish conquest via Reddit! It's absolutely wonderful to know so many people are interested in this underrated bit of history. And a huge thank-you to the reader, whoever you are, who put the post on Reddit in the first place - your efforts in Project 'Publicise the 1000th Anniversary of the Danish Conquest' are much appreciated! (I need a snappier name for the project, though). [O]n þissum ilcan geare toforan þæm monðe Augustus com Swegen cyning mid his flotan to Sandwic, 7 wende swyðe hraðe abutan Eastenglum into Humbra muþan, 7 swa upweard andlang Trentan oð he com to Gæignesburh, 7 þa sona beah Uhtred eorl 7 ealle norðhymbre to him, 7 eall þæt folc on Lindesige, 7 siþþan þæt folc into Fifburgum, 7 raþe ðæs eall here benorðan Wætlingan stræte, 7 him man sealde gislas of ælcere scire. Syþþan he undergeat þæt eall folc him to gebogen wæs, þa bed he þæt mon sceolde his here mettian 7 horsian, 7 he þa wende syþþan suðweard mid fulre fyrde, 7 betæhte þa scypu þa Cnute his suna, 7 syþþan he com ofer Wætlinga stræte worhton þæt mæste yfel þæt ænig here don mihte. Wenda þa to Oxenaforde, 7 seo buruhwaru sona beah 7 gislude, 7 þanon to Winceastre, 7 hy þæt ylce dydon. We'll stop at that point, before the Danes get to London, so we can focus on the really extraordinary things this entry tells us. The first thing to note is the speed with which all this happened: the Chronicle emphasises this several times, and it suggests an invasion which was premeditated and carefully planned. The whole period from arrival to the submission of Winchester may have taken not much more than two months - that would take us to the end of September. But the initial submission (what one historian calls 'the Gainsborough Accord') took place almost at once, and may well have been pre-arranged via messengers travelling between Denmark and England. It's difficult to imagine Svein coming all the way down the Trent to Gainsborough without being sure he would meet no opposition; that's a long way inland if your enemies decide to cut off your escape to the sea! Historians have various theories on why the leaders of the north joined forces with Svein so quickly. What's clear is that they weren't under duress - Svein wasn't raiding or harrying in their lands. They may not have had the forces to resist him, but the swiftness of their submission - just a matter of days - suggests they didn't try to. Why would these men be so ready to join Svein? The most likely reason is dissatisfaction with King Æthelred and his favourite advisors, such as the notorious Eadric Streona. These were the people doing the bad advising which earned Æthelred his nickname 'Unready' (or 'Bad Advice Æthelred', as I like to think of him). 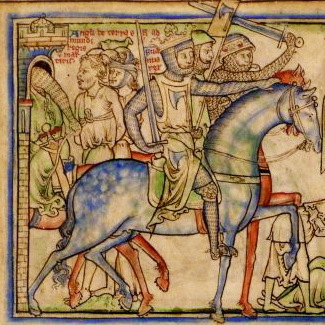 Æthelred had done a number of things to lose the trust and support of his ealdormen: the biggest was failing to prevent or respond to Viking attacks in any effective way, but equally damaging was his collaboration in violence against his own men, apparently allowing Eadric to pursue personal feuds with the backing of the king. The most shocking of these had occurred seven years earlier, in 1006, when the king permitted or ordered (the whole thing is a bit of a mystery) a full-out assault on one of the most powerful families in England. Ælfhelm, ealdorman of Northumbria, was killed and his two sons were blinded - and it was the surviving members of this family who in 1013 made an agreement with Svein. They did so in a particularly interesting way. It's not mentioned in the Chronicle, but shortly after Svein's arrival a marriage took place between his son Cnut and Ælfgifu of Northampton - daughter of the ealdorman Ælfhelm who had been murdered in 1006. Since Ælfgifu's father was dead the marriage was probably arranged by her kinsmen Sigeferth and Morcar, two brothers who are not named in the Chronicle entry but who held authority in the Five Boroughs and probably arranged the submission of that region to the Danes. Presumably this marriage too had been planned in advance of Svein's coming, and in this way Svein married his son into the family of one of his most useful allies. This, more than anything, says to me 'the Danes had come to stay'; smash-and-grab Vikings do not arrange diplomatic marriages. It also tends to argue against the possibility (suggested by some historians) that the 'northern rebels' were only using Svein and his fleet, to frighten or control Æthelred, and never intended to set Svein up as king. Well, maybe that was their plan, but if so it wasn't a very sensible one - once you've welcomed a foreign king into the country, and got him to marry his son into an English family (providing a ready-made heir with strong English connections), he's not very likely to just sail off again when you're finished with him. As, indeed, he did not. 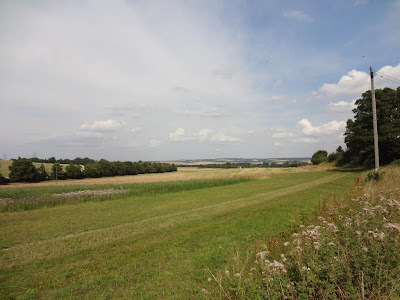 Watling Street - a cross-country roadway known to the Saxons as a paved Roman road, though in fact a track older than the Romans - is a hugely important psychological border in the Danish invasion. In the days of Alfred the Great this border was set as the boundary between English and Danish-controlled land, as part of the agreement Alfred made at Wedmore in 878. 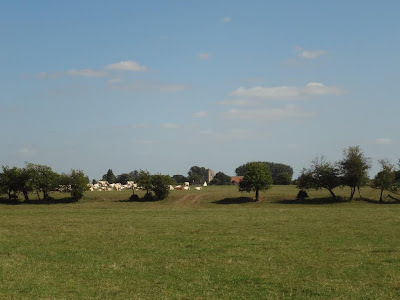 The Danish army who had been Alfred's opponents settled north and east of Watling Street - 'they began to plough and support themselves', as the Chronicle has it. In many ways they integrated quickly with their English neighbours, but it seems the mixed Anglo-Danish heritage of these areas remained part of their local history and sense of identity, as their surviving legends reveal. Many of the men who came to meet Svein in 1013 might have had Danish ancestry, a few generations back, and they probably knew that Danes had controlled parts of northern England before. If you'd asked them, they probably could have told you a story or two about the legendary sons of the Danish Viking Ragnar Lothbrok, Ivar the Boneless and his fearsome brothers, who conquered York with a raven banner fluttering above their army and put the English kings to flight. (Cnut's army would later say that he, too, had a raven banner which predicted victory in battle, and his poets would compare him to Ivar as a scourge of English kings). Whatever Uhtred, Sigeferth and Morcar were hoping to achieve by submitting to Svein, there may have been some inhabitants of the former Danelaw who hoped Svein could do what those Danish kings had done - or, as it turned out, go one better. These people don't get a voice in the Anglo-Saxon Chronicle, which instead tells us that the Danes "did as much harm as any army could do" - but note that they only did this after they crossed Watling Street, that is, once they had crossed out of their allies' lands. This suggests they had not been harrying the Midlands into submission as they went. Once they got into Oxfordshire and further south, it was a different story; no wonder the citizens of Oxford and Winchester (and probably one or two other places on the route, unmentioned by the Chronicle) gave in so quickly. They clearly didn't think they could resist by themselves, and they weren't expecting any English army to come and help them. The son of King Harald Bluetooth of Denmark, Sweyn began his reign after killing his father. In 993 he began a series of raids to England, forcing King Ethelred ‘the Unready’ to pay off the Viking plunderers with 16,000 pounds of silver in Danegeld. Sweyn added Norway to his territories in the year 1000, overthrowing King Olaf at the Battle of Svolder. He continued devastating raids in the south of England in retaliation for the massacre of Danes by Ethelred on St Brice’s Day in 1002. Finally, in 1013, Ethelred fled into exile and Sweyn was acclaimed king by his terrorised English subjects, only to die suddenly a year later. Leaving aside the fact that Svein did not exactly kill his father, what bothered me about this description is the 'terrorised English subjects'. How many of the English people we've discussed in this post seem to you like they might have been terrorised into accepting Svein as king? The citizens of Oxford and Winchester, certainly (though Oxford suffered hardly more from the Danes than from Æthelred's St Brice's Day massacre) - but all of those people in the list given by the Chronicle, from Uhtred and the Northumbrians to the inhabitants of Lindsey and the Five Boroughs, were not being terrorised; these were desperate times, but they turned to Svein of their own free will. 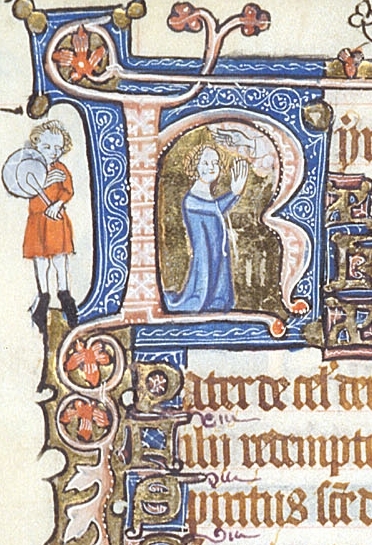 Ælfgifu of Northampton wasn't carried off as a helpless captive of war; her family strategically married her to a young prince whose father was winning him a kingdom to rule, and it proved a smart decision (Cnut later made her ruler of Norway, not a bad career move for an English girl from the Midlands...). Now, we don't rely on the heritage industry to tell our historical stories accurately, only entertainingly - and just as well! - but this illustrates how easy it is to tell any story in which Vikings are involved as one of violence and brute force. The story of Svein's invasion did eventually involve battles and bloodshed - but the success of the conquest we're considering, which brought Svein to be ruler of all the region north of Watling Street and a big chunk of the south of England, was achieved more than anything by Danish diplomacy. As I continue to work on my next post about the Danish conquest of England (coming tomorrow, I hope! ), here's something for those of you less enamoured of eleventh-century history than I am: a poem by Rupert Brooke, who was born on this day in 1887.